Jennifer Bronsted is Gulfshore Playhouse’s Resident Costume Designer/ Costume Shop Manager. Jennifer’s designs will be on our stage for THE MOUNTAINTOP, BODY AWARENESS, JACOB MARLEY’S CHRISTMAS CAROL, and VANYA, SONIA, MASHA, AND SPIKE this season. I returned to Gulfshore Playhouse this season refreshed by my summer. Many w onderful things awaited me. The biggest change was the moving of the costume shop from the FGCU building to the Norris Center. It’s wonderful to be close to rehearsals and the actors. I’m excited for the change to a bigger space. But another delightful surprise was in store for me. The costume shop received many donations this summer. We are the happy recipients of gorgeous fur coats, capelets and jackets. One is a stunning full length vintage dark sable fur and another is a vinta ge leopard fur jacket. Another donation included all sorts of handi-crafts: knitting supplies, yarn, needles, embroidery floss, canvas and transfer patterns. The donation included booklets and patterns for knitting, crochet, embroidery work and other craft patterns. Part of the donation which may find the most use is the fabric, sewing notions and sewing patterns. I love receiving vintage fabric; there are prints you can’t find or materials that are not produced now. Even small scraps of fabric can be useful in the costume; from pocket squares to collars we can find a use. And vintage patterns help with garment construction, but also with researching for a show. But my favo rite part of the donation was the patchwork quilting. The donation included some worked piecing, which is just fantastic to look at. 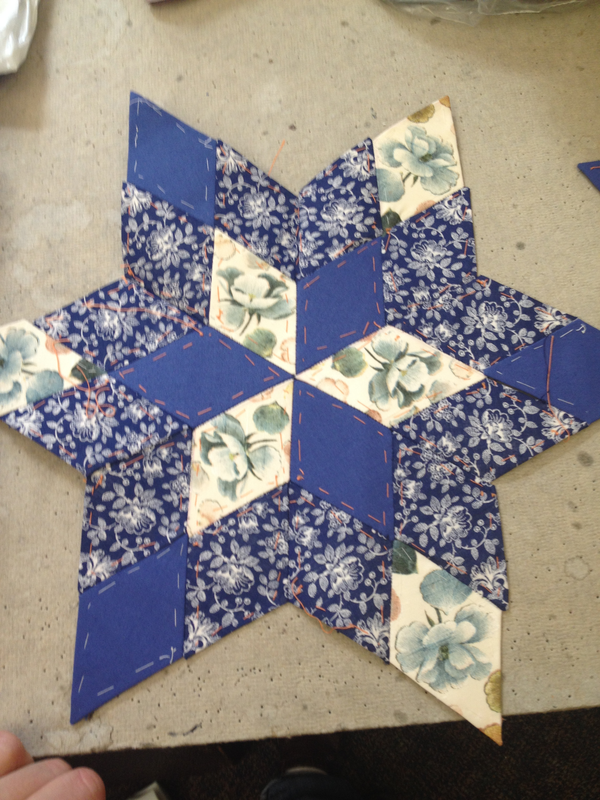 I’ve done some simple quilting, but had not had a chance to study on how patchwork quilting was accomplished. I had no idea that the quilts were hand stitched together. I’m planning on framing one of the pieces for display in the costume shop. I love receiving donations, but most especially fabric, trim and other sewing supplies.